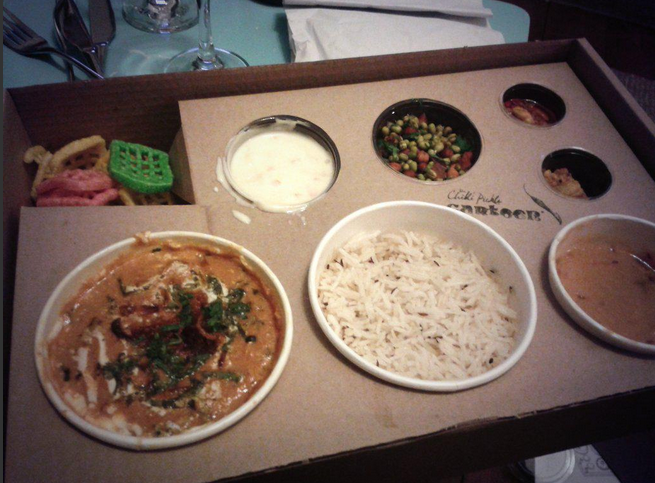 A takeaway is a pretty rare event in our home but a Chilli Pickle Canteen delivery would be our first choice. It's far beyond your average takeaway and a shame to put it in that category at all really. I'd prefer to file it instead under "restaurant food home delivery" as the Canteen service is as good as eating in their Jubilee Street restaurant itself (minus all the pretty silver trays and dishes). I know I bang on about my love for this restaurant but I suppose the biggest respect I have for it is the unfaltering quality they have retained since opening in 2009 (winning some well deserved awards in the process too). Despite their success they haven't taken their eye off the ball or let greed get to the better of them by cutting corners. Instead thy continue to dazzle us with regional Indian dishes and gaining themselves somewhat of a Brighton institution status. The CP canteen service is a bit of a lifeline at the moment. A new baby sort of halted any plans for a nice restaurant visit on our anniversary, so the next best thing was to get a delivery at home (eaten with said new baby asleep on my lap -sigh...the romance). I've eaten pretty much everything now from this restaurant but I realised I have never tried their vegetarian food (made flipping hard with their incredible tandoori meat platters, fish dishes and succulent meat curries). 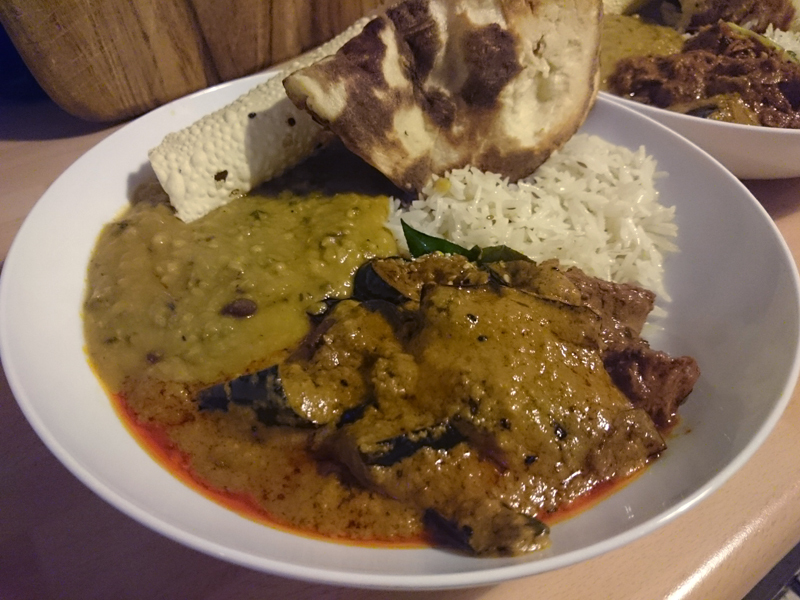 Takeaway curry doesn't photograph well but taste is everything! In some ways I think you need more skill to make vegetables shine against the punch of Indian spices but the Aubergine Stew with Pickling Spices sounded good. I love nuts and Indian spices together and the stew had fried aubergine slices with a tamarind, peanut, cashew nut jaggery and sesame gravy tempered with pickling spice. As it turned out, the aubergine was sweet, smokey and silky with savoury, nutty undertones against sweetness of the jaggery. I really thought I was going to catch them out here but no, they handle vegetable dishes with equal success of everything else. I can vouch that vegetarians would never feel second best in this place. Mr Graphic Foodie was obviously not on board with my vegetarian test and went for his typical robust meat dish, this time a mutton curry with warm spices, ginger, shallots, chillies, coriander and fresh tomato. The meat was tender and full flavoured, with plenty of layers of spice as well as heat. I also added a mung Dahl for a nutritious, hearty and earthy element. The beans were filling and textually contrasting. And we mopped up everything with fragrant pilau rice and naan breads. The Chilli Pickle is a restaurant that's been with us in the intense years where everything gets serious and grown up. We've celebrated birthdays, anniversaries, engagements, toasted first home purchases and even tried to instigate labour too! Most people have that restaurant in their lives and I think the CP is certainly one of ours.